Because it was only the end of March, the herbaceous borders were still very much dormant; a wren was flitting around a leafless bush, and in the lawns hundreds of crocuses were opening up to the morning sun. 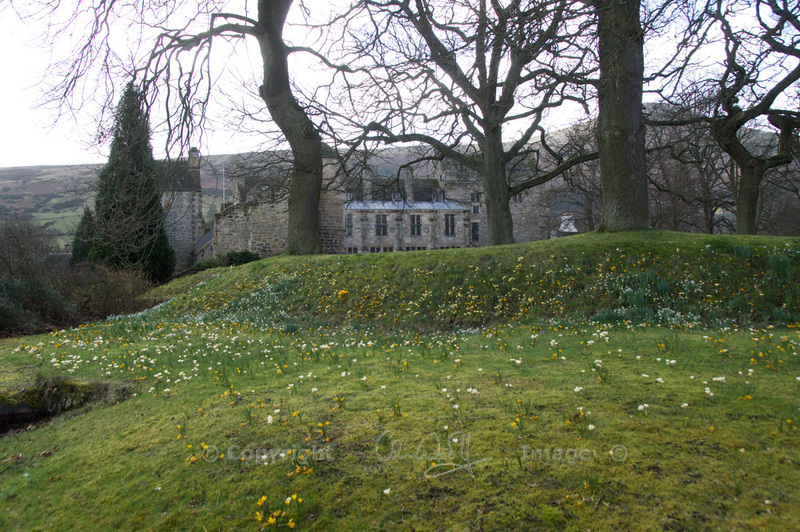 Seeing Colin absorbed in photography, I suddenly remembered something I’d read about Falkland Palace – one of its original features – and I took myself off to find it. Across a paved area, through a door and down a few steps… and there was the original ‘real’ or ‘royal’ tennis court, built in 1539 for James V.
I’ve never seen anything like this before. I was standing in the spectators’ area, a long corridor with openings down the length of one side, facing onto the court. The openings had been netted off, presumably to protect visitors from getting knocked on the head, and on the court a National Trust guide was batting a few balls around. This is where I have to explain why my photos aren’t particularly good. The tennis court at Falkland, although breathtaking in its history, is probably the most difficult thing to photograph that I’ve ever come across. Its stone walls are about 15 feet high, and the render is painted a very dark grey. Added to this, when I asked if it would be all right to take some pictures, I was invited onto the court for a game! I didn’t need to think twice about that. After all, who could resist the temptation of playing on the same court as Mary, Queen of Scots, who apparently caused a scandal by wearing breeches so that she could run for the ball? I’m rubbish at tennis, but I figured that my new coach would work that out for himself. Forget everything you see at Wimbledon; this is a whole new ball game. For a start, the ball weighs about twice as much as a modern one, and it’s got very little bounce. It’s like playing tennis with a potato. The racquets have an oddly warped shape and are smaller than they are today; this is because they evolved from the medieval French game of ‘jeu de paume’, where players hit the ball with their hands. A net (formerly a tasselled rope) is stretched across the centre of the court – I like the way it dips towards the middle, which is a great idea! The players stand either side, pretty much as they do nowadays, except that the royals had a servant to ‘serve’ or hit the first ball for them, which is where the term comes from. 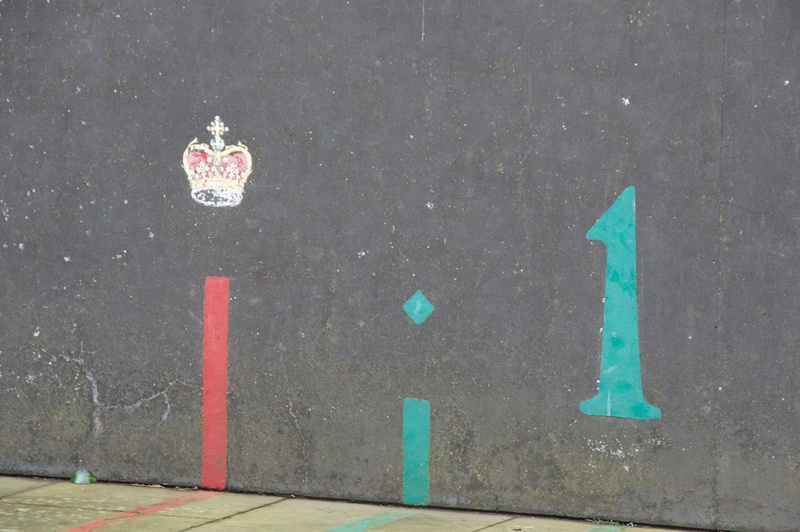 The server must hit the ball directly onto the sloping roof of the spectators’ gallery or ‘penthouse’, from where it rolls and bounces into the opponent’s court. The opponent hits it back, winning a point if it hits the ‘ais’, a green-painted wooden stave which you can see in the first photo, in the right-hand corner. You can also score a point by driving the ball through one of those small rectangular holes in the wall. Some chance! In the 1500s tennis was called ‘caichpule’, which is Flemish for ‘game of chases’. A ‘chase‘ can be called if the ball is hit between some of the painted lines, which are spaced a yard apart, but the rest of the rules are really above and beyond my scope. Let’s face it, I could hardly hit the ball! Getting a small and oddly shaped racquet to connect with an un-bouncy ball was the weirdest experience. Either I threw the ball up, and missed it on the way down, or I swiped at an anticipated bounce which didn’t happen and I nearly fell over. The guide didn’t show any disappointment in my lack of potential, which was polite of him. He was extremely knowledgeable about the history of the game, and he could obviously put the ball exactly where he wanted it to go. I only wish I’d been a more worthy opponent. The royal tennis court at Falkland Palace is the oldest of its kind in the world; there were once courts at Holyrood House, Edinburgh Castle and Linlithgow as well, so the Stewart kings must have loved their sport. 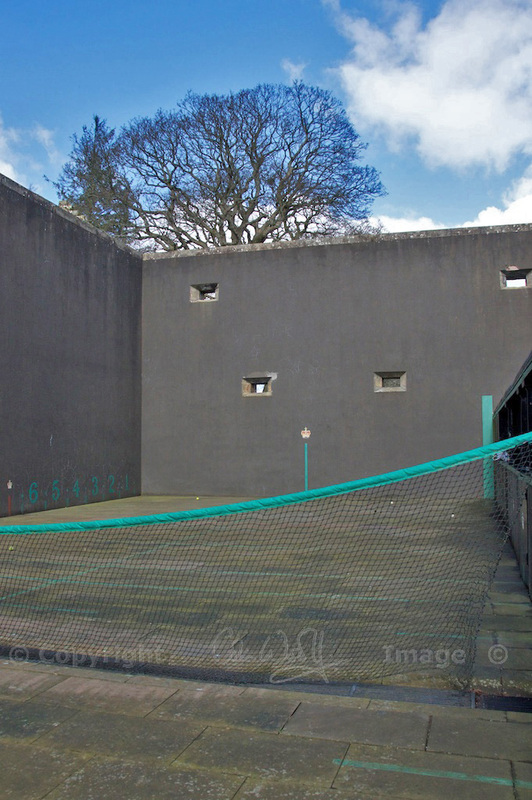 And it’s still being used… the Falkland Palace Real Tennis Club meets here regularly, and it has been described as ‘tennis heaven’. I’ve obviously got a long way to go. And yes, I did eventually find my way back to Colin! The National Trust for Scotland manages Falkland Palace, which is open from 1st March to 31st October. It lies in the village of Falkland in Fife, which is about 40 miles north of Edinburgh. If you missed my feature on Falkland Palace, take a look… it’s the most beautiful and intriguing place, so full of history that it’s practically oozing out of the walls. Yes, it was really fun and fascinating at the same time! I am pretty sure your husband would be much better at it than me! You actually played on the court – wow! I’ve seen it for myself and wished I could have a go but there was no friendly guide on hand to offer me the chance. That must have been quite an experience, and amazing to think that you were following in the footsteps of Mary Queen of Scots. I like your analogy of playing tennis with a potato, that sounds extremely challenging. It is a very austere looking building, and I think you did very well to photograph it. Yes, I know! I was very lucky, I think. I only wish I could have done it more justice. I’m glad there was no one else there to see me missing the ball so many times, I felt a complete idiot! If you’ve seen it you’ll know how hard it is to photograph. It’s quite a forbidding looking place, really. I wonder if Andy Murray has any Stewart genes in him? Loved both posts on Falkland, what a wonderful survivor from history. Haha, good thought, Anny! It might be truer than we think. Thank you! Yes, it really is amazing how well the tennis court has been preserved. Another brilliant article, thank you! We agree it is very difficult to get a good photo of the court without climbing the roof! Too bad tennis players today don’t hit the ball off of a roof, that sounds pretty exciting! Great article, Jo!